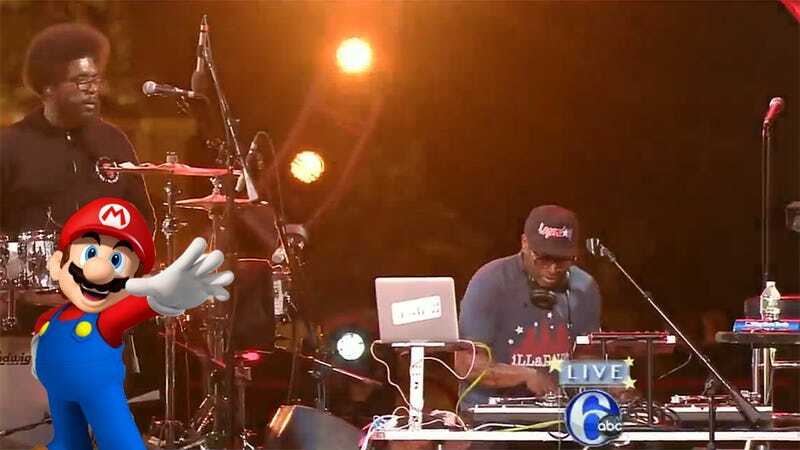 During yesterday's Fourth of July Jam in Philadelphia, DJ Jazzy Jeff (sans Fresh Prince) and Jeremy Ellis got into a Super Mario Bros. remix battle, accompanied by The Roots. This is a thing that happened. Philly's Action News 6 (via Nintendo Life) posted footage of the epic DJ battle, which DJ Jazzy Jeff won solely based on the fact that he's DJ Jazzy Jeff and I had to Google Jeremy Ellis. He seems like a lovely man, but he knew who he was up against. Update: the ABC video is not embedding right. Here's another version from YouTube, courtesy of reader Orionsangel. You know when you're at a concert for a band you aren't too familiar with and that one song you know comes on? This would have been so much that for me.